The first step is taking apart the old house, so the foundation can be expanded and the new house built on top of the new and old. The owner has been posting a non-stop stream of photos on their project blog, and we've loaded them in a photo browser for you here. Continue reading "MoTrad House - demolition begins"
As we enter Day 18 of my expo of Swedish Factory Houses on the LamiDesign Idea Log I can barely contain the magnitude of my outrage. I had to write this blog post simply to stop myself from going to the window of my studio, sticking my head out of the opening and screaming "I'm mad as Hell and I'm not going to take it anymore!" You have to understand the staggering, colossal, and tragic scale of the FAIL of the US Housing Industry to serve its customers. So here is the deal. Sweden, a small country with the population of NJ, the size of California, manages to offer within its limited market dozens, I'll wager hundreds of modern house designs to its customers. And its not like each home builder has one or two token modern houses in the catalog. They all have a dozen or more. Even if you are part of that smaller margin that likes a modern house, you still have choice of dozens of houses where ever you might look to build a house. Yet here in the USA our corresponding mainstream home builders offer none. Nothing. Nada. Something is clearly wrong here. Our home builders say "if its not what most people want, then I won't offer it." In Sweden the mantra is completely reversed: "if its something that somebody will want, then we'll certainly offer it." Continue reading "PreFab is Dead - the staggering FAIL of US Housing"
I don't often share projects from my local clients, unless they are modern or they have some connection to our Modern House Plans. In this case the project is a local build in Pennsylvania just outside Philadelphia. Its technically a renovation, but in truth is starting at the ground floor and rebuilding from there up, and adding to the back of the house. 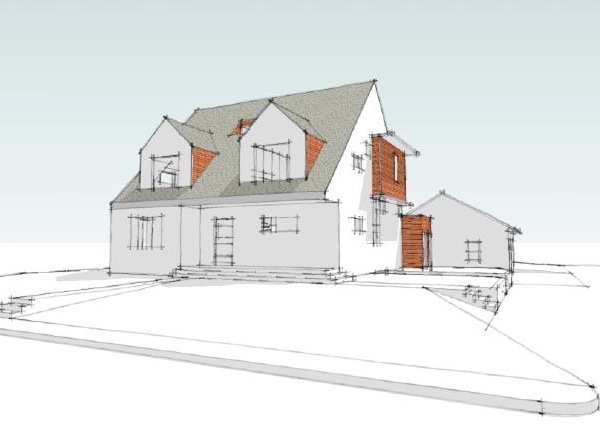 The new design shares a lot of DNA with the XHouse3 house plan, which is why we are going to watch the construction here. Above and below is the existing house. A masonry one story houses, with a cape cod like proportion. One and a half story you would call it, as there are a couple of bedrooms under the rafters on the second floor. 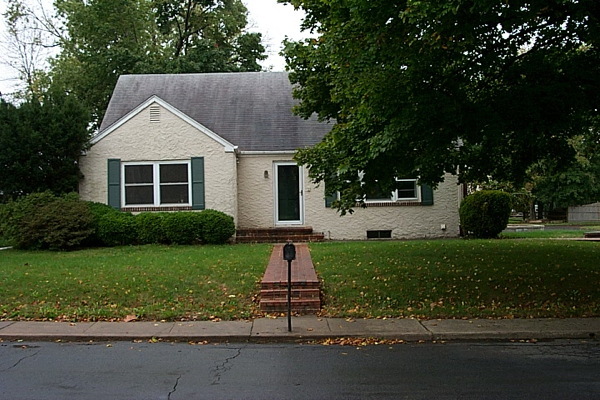 It has a companion detached garage to the rear, and its on a corner lot. Most of the house's neighbors are taller, with greater stature, so part of the brief was to give the house more presence. Owner also wanted the house to be compatible with the neighbors at the front, but modern in the back. Sounds like a job for a MoTrad Stealth house! And this is what the house will be transformed into. In front the house respects the geometry of the existing historic homes, the Cape Cod roots of the house even more evident now. 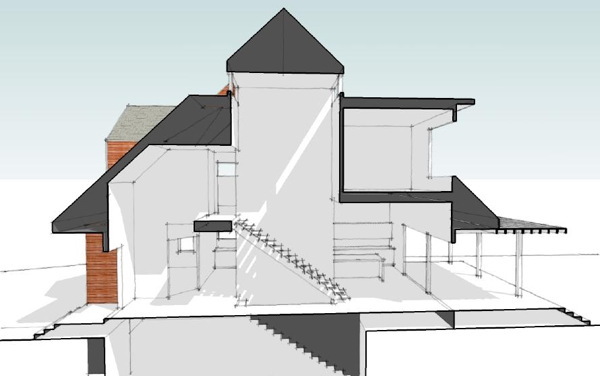 Yet the house and its dog-house shaped dormers will have a stark minimalism to their detailing. In plan the house has much in common with the XHouse3, although the scale is slightly larger here. A centrally located stair takes you up to the bedroom level, and another short stair takes you up to the Master Bedroom level. Another couple of feet above the second floor, it affords the main living spaces a high ceiling. The owner spent a lot of time getting to this point. Several other architects were engaged and ejected before we set to work on the design. He traveled to modern home tours in California and Atlanta all to collect ideas and take pictures of modern home inspirations. We worked through the schematic design, and advised as he applied his engineering background to preparing the construction drawings himself. Here you see a section through the core of the house where an atrium extends up to the attic level above. This chimney ventilation will aid in venting warm air in the summer. 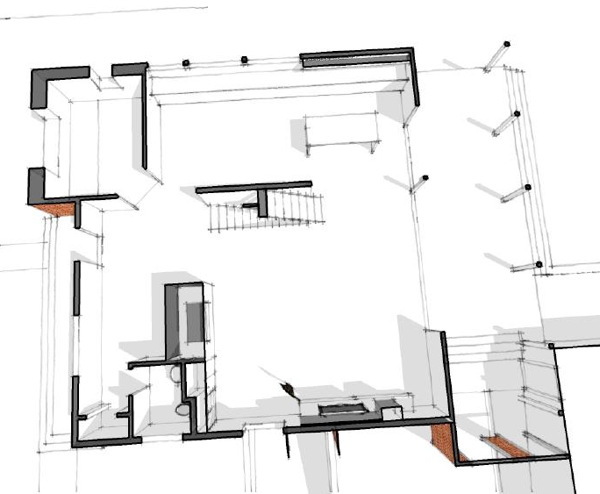 More images of the house design can be seen on our web site. The owner is self contracting, so we expect the pace to be slower than a full time gig, but follow along. It should be fun to watch this come together. 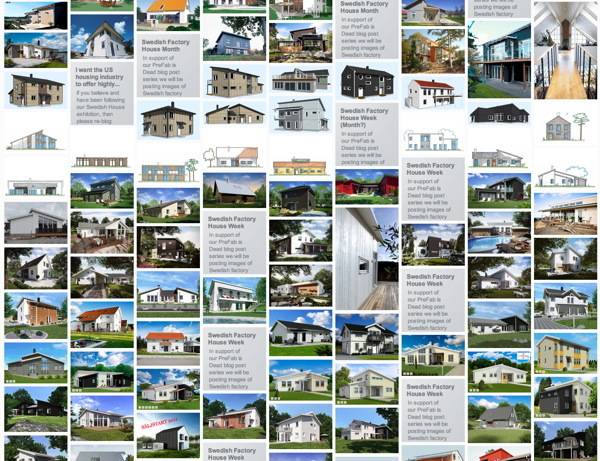 Continue reading "MoTrad House - a new local client build"
As much as my Swedish housing industry research colleague Scott Hedges and I would like to think we discovered the success of MMC in Sweden, we have to credit work which has encouraged our thinking and research. The methods we are examining were described years ago by much greater minds than ours. During the 1980's scientists working at the Lawrence Berkley Energy lab noticed that less energy was being used to heat homes in Sweden than in other industrial countries. Was the data wrong? No, Sweden was outperforming other countries. A man named Henry Kelly, who was director of a group called American Council for an Energy Efficient Economy, along with a Berkley scientist Lee Schipper, and colleague Stephen Myers, realized that the Swedes weren’t just building a few energy efficient houses. Rather they had managed to make the average house, the kind built every day much more energy efficient. The Swedes had changed housing though a comprehensive effort encompassing the building products industry, the construction industry, national building codes, national lending practices, and trades unions. The USA had just passed through a severe energy crisis that rocked the entire economy. Our band of researchers saw what this could mean to energy policy in the USA. Determined to quantify the progress in Sweden, they secured a grant from the German Marshall Fund and cooperation from the Swedish Council for Building Research to do something that is rarely (if ever) undertaken by the building industry: an international collaborative study to find out what actually went on in Sweden and how it might inform the way we build and structure our housing industry here in the US. 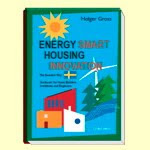 Their report was done in 1985 and the results distilled into a small book called Coming In From the Cold: Energy-Wise Housing In Sweden. Continue reading "Coming In From the Cold - the story behind the story or How the nations top scientists gave up on US home builders"
All week we've been talking about factory house building in Sweden, and American timberframer and house manufacturer Bensonwood. 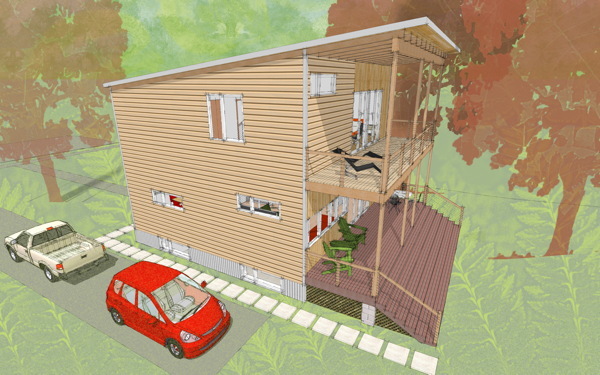 The good news is that Bensonwood has begun to offer our house designs in their energy efficient building systems. The first house to be offered is the XHouse2. We went through a detailed redesign of the XHouse2 with Bensonwood's engineering staff in preparation for this offering. The Bensonwood version of the house is subtly different on the outside. The front porch and rear deck framing is updated to be built with their timber-framing prowess. The wood cladding on the house reflects the products they have incorporated into their material stream. Internally the framing and details are completely revised to be built with factory made wall panels for a tight and energy efficient house. So although the design is clearly the same house, this is a unique edition you might say, only available through Bensonwood. Our house plan version remains designed for generic construction methods for the widest possible suitability. In fact its this generalized nature of my designs that allow them to be so readily adapted to Bensonwood's systems. We're very excited to be able to offer our designs with such a high performance building system. Now you will find a new house plan group on our site for Bensonwood offerings, and the dedicated catalog page for the Bensonwood version of the XHouse2. From that catalog page you can click over to their site and land at their XHouse2 page. Bensonwood will offer packages in different stages of completion from fully finished panels in their high performance Open-Built® format, to open framed panels only. This is a first step, although admittedly a small step, towards establishing a foothold for these new MMC/OSM manufacturing methods in the US. Look for us to expand the influence of these techniques in the future. Continue reading "Greg Lavardera's Modern House Plans + Bensonwood"
PreFab is Dead - When can we expect MMC/OSM? For the past week I've been writing about what is wrong with PreFab in the US, and I've been writing about what is right about OSM in Sweden. The inevitable question is when will that come to the US? Is there anybody building like that now? The answer is while there is nobody working precisely as the Swedes do here, there is a builder who works with a very similar process, and even more importantly is an active student of Swedish and German building techniques. That builder is Bensonwood out of Walpole New Hampshire and we've just begun to offer our house designs built by them. But before the big announcement, let's look at what they are doing. There are a number of US builders that have imported the various machines that are like the ones used in Sweden and in Germany, and they have used them for fabricating houses in panels - panelization as its called. But these builders do not attempt to finish their walls on both sides. Few even attempt to finish them on one side. Hence much of the great advantage of the technique is lost as a great deal of the work is still sent out to the field. There have even been attempts to import houses from Sweden, shipping them in their flat panel form to be assembled here in the States. A small quantity of houses were built and sold, but the designs of the Swedish houses admittedly did not make a clean fit to American expectations. For the most part the American housing industry has ignored Sweden's great achievement. A government funded report on the Swedish housing industry from the 1980s called "In From the Cold" documented the progress and results of the change to housing in Sweden. They presented this as a model for the US industry to follow, and then it largely fell on deaf ears. The researchers that conducted the study and wrote the report threw up their arms and moved on to other research topics. The few that have taken up some of these lessons have never carried them very far into the building process. They've done open panels, little more. Bensonwood's journey into this was somewhat different. Coming from the American timber framing craft, Tedd Benson was quick to adopt computer driven milling equipment that he saw being used in Germany. This led him into the other types of automated fabrication techniques that were being used there, as well as leading him to be being present for the birth of the Passive House movement in Germany. Benson has been steadily taking this technology and the lessons of how they were building back to his shop in New Hampshire and evolving the way he builds homes here in the States. He's faced the same stumbling blocks that we've reviewed in examining the Swedish factory. Our building products here don't help you to panelize your walls, never mind make a high performance home. So along the way Bensonwood has been diligently adapting American products, importing european products where practical, and inventing what was missing, all in the pursuit of an intelligent manufacturing process. 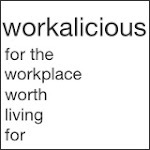 There is that word again! Intelligent! They have been connecting the dots where American component suppliers fail to, and building more and more value into their product. This is their form of MMC and OSM. Continue reading "PreFab is Dead - When can we expect MMC/OSM?" This is going to be the mantra: MMC is Modern Methods of Construction. OSM is Off Site Manufacturing. PreFab just does not cut it because transposing conventional construction activities to under roof is only a tiny step towards removing inefficiency from the building process. So much more can happen, and it can all build value for the customer. So what happened in Sweden? We've gone over many of the details of how their building practices differ in prior posts. But what happened that enabled them to get to this point? In our LamiDesign Idea Log we've been posting images of Swedish Catalog House designs that are Modern. We've posted dozens so far, and there are more and more and more to show. How is it that a small country like Sweden can offer such a range to a market of limited demand like Modern? Yet here in the USA our larger merchant builders can offer none? Even if the percentage of buyers interested in modern in the USA is less than in Sweden, if you added them all up it would be larger than the entire market for the whole of Sweden. Yet our builders here can't even address this market with a single viable product? Not one modern house offered by the big builders that represent the majority of our market. Can you grasp the enormity of this failure? Continue reading "PreFab is Dead - Long live MMC and OSM"